Home » Blog » How Upworthy Climbed The Virality Ladder To Rule The Web? Upworthy has mastered the dark viral arts to change the internet forever. Upworthy’s ultimate goal is to find and repackage content that is visual, meaningful, and sharable. Today, Upworthy’s instant-virality strategy turning under-exposed news stories into viral gold. Unlike any news site/blog, rather than creating its own content Upworthy seeks unearths hidden gems from the internet in form of images, videos and graphics which were initially overlooked by mass people. 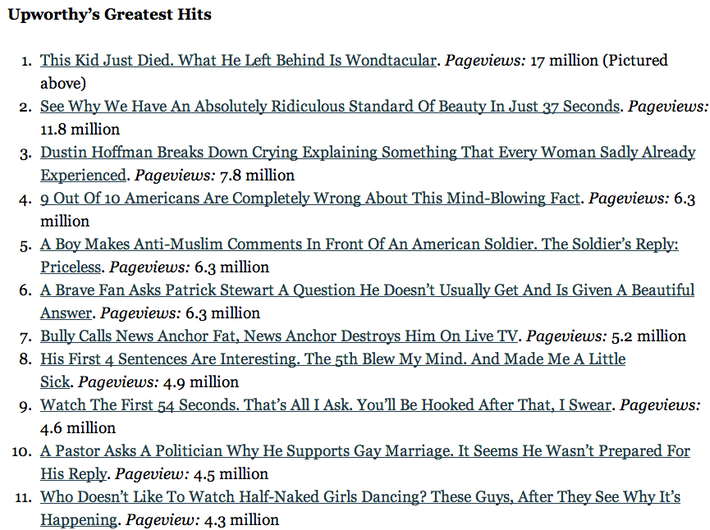 Here are Upworthy’s 11 greatest hits, whose page views are overwhelming. Upwothy has shown us unique and very powerful strategies of packaging & presentation to become popular among wide audience. It has changed the mindset of many internet marketers and their strategies to go viral with social media. Within 270 days after launch Upworthy has won 791,000 Facebook Fans, 10,000 Tumblr Followers, 43,000 Twitter Followers and over 7 million monthly uniques over a span of 7 months. Our friends at Marketo have created this awesome infographic which illustrates how Upworthy’s tactics have put them on top. Viral Publisher Upworthy is somewhat similar to any other media publishing sites. But what made it so successful? Upworthy Co-Founder Eli Pariser reveals its secrets. So how Upworthy has changed the internet ball game and you can too. Here are 6 tactics Upworthy used to go viral. An Upworthy curator starts their day surfing different social media outlets like Facebook and Twitter. Because it’s always easier to highlight an ongoing conversation than to start a new one. Upworthy tends to go with visual, sharable content rather than articles and blogging. Upworthy figured out that Facebook is much more efficient than Twitter when it comes to traffic. At the end of the day, most people spend the huge of their online-time on Facebook. Upworthy hasn’t done anything extraordinary to squeeze the most traffic out of Facebook. But they spent a lot of time and energy cracking the social network. As Spike data shows us, Facebook is huge. Much bigger than Twitter. 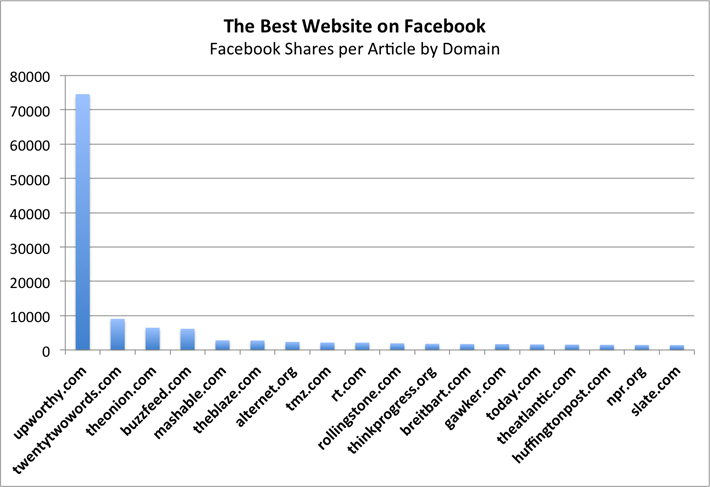 If you take the biggest sites on Twitter and then graph their Facebook shares, here’s the picture you get. When it comes to traffic, we’re living in a Facebook world. And Upworthy is, for the moment, its king. Upworthy has a team of curators who finds under-exposed news and repackage it for Upworthy. There isn’t much original content on the site. But for every article Upworthy curators write 25 headlines, among which they picks up their four favorites, and Upworthy’s managing editor makes the final call. The idea behind the 25 headlines is to have the best piece of content and make the best point ever. But if no one looks at it, the article is a waste. A headline is all about getting the article in front of people. Upworthy co-founder Peter Koechley says the site uses the curiosity gap to create headlines that tells the reader enough to pique curiosity but not enough to give the whole story away. And these headlines play a huge role in the virality of Upworthy content. Recently Buffer has examined 3,016 headlines from 24 top content sites. Here are the most popular words found in their headlines. The average length of a viral headline is 62 characters. The percentage of headlines with a number was 19%. 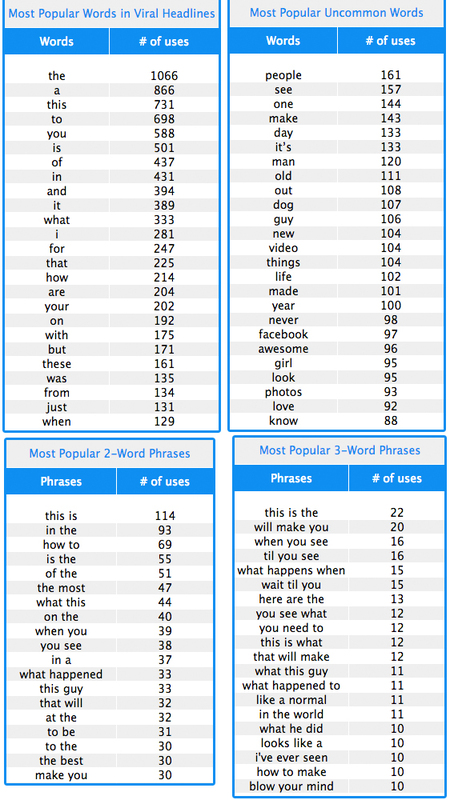 Play around with some of the most popular headline words mentioned above to test some new, unique combinations in your own content. Upworthy publishes stories on its website and Facebook Page and makes it easy for people to share. It uses two large share buttons, one on Facebook and another on Twitter. It also uses a pop-out box & a slider that prompts people to “Like” its page. This strategy has led to overwhelming growth. Over the year, Upworthy has accumulated 5.7 million Facebook fans who are reader zero in their viral content model. Getting more Facebook shares or Twitter retweets is not an easy task — but if you use the right words you can win the game. Luckily our friends over at ShortStack & Socially Stacked have put together a great infographic on top words to encourage shares. When it comes to social shares Facebook isn’t the only game you would like to play. 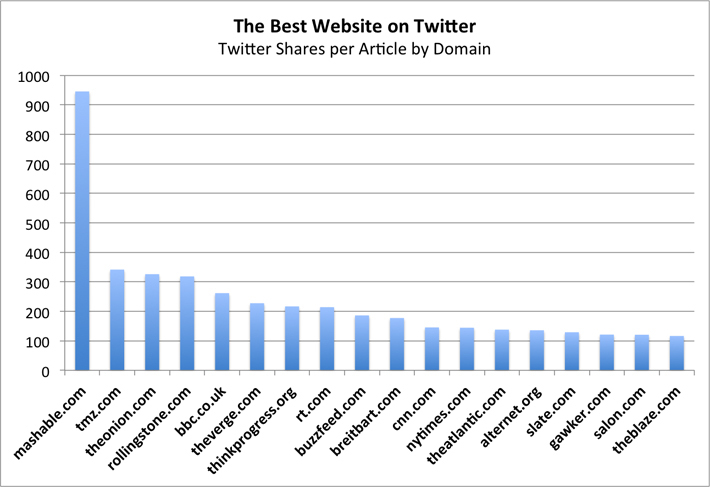 Focus on Twitter too, Mashable turns out to be the most popular site on Twitter shares per article. Test with other social networks and try to figure out which one works out for you. 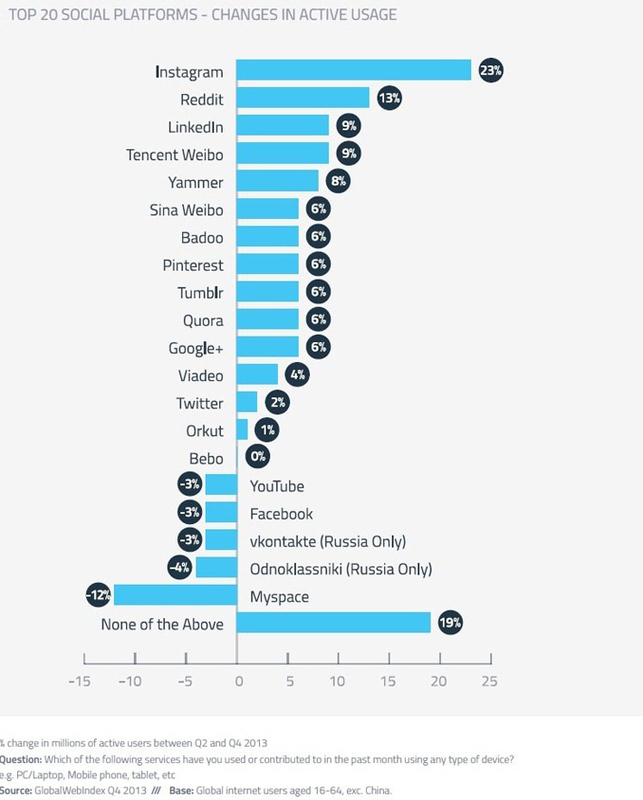 According to new research from Pew, Instagram is quickly becoming one of the most interesting places to be online. Go where your audience is and share what matters to them. No Upworthy headline is final until social media followers have spoken. According to Upworthy, a good headline can be the difference between 1,000 or 1,000,000 people reading or viewing a story. When it tests headlines, Upworthy sees a 20 percent, 50 percent, and even 500 percent difference between headlines for the same story. Then Upworthy uses the data to further optimize its content. Test, test and test more to open the viral flood gates for your content. Google Analytics event tracking can be your best mate while A/B testing. Upworthy has a mobile product that drives 30% of its traffic, but first and foremost it’s a web publication. Praiser & his time spends a good amount of time on making Upworthy’s mobile experience better. Last but not the least only hit publish when you can be awesome, as a community is built around quality and shared values, not on how many times you appear in their feed. What do you think about Upworthy’s tactics for growing an audience in an ultra-competitive space? Let me know your thoughts by leaving a comment below! Honestly, this is one of the better and more educational posts that I have come across in a while. No one can come away from this without understanding that changes need to be made. 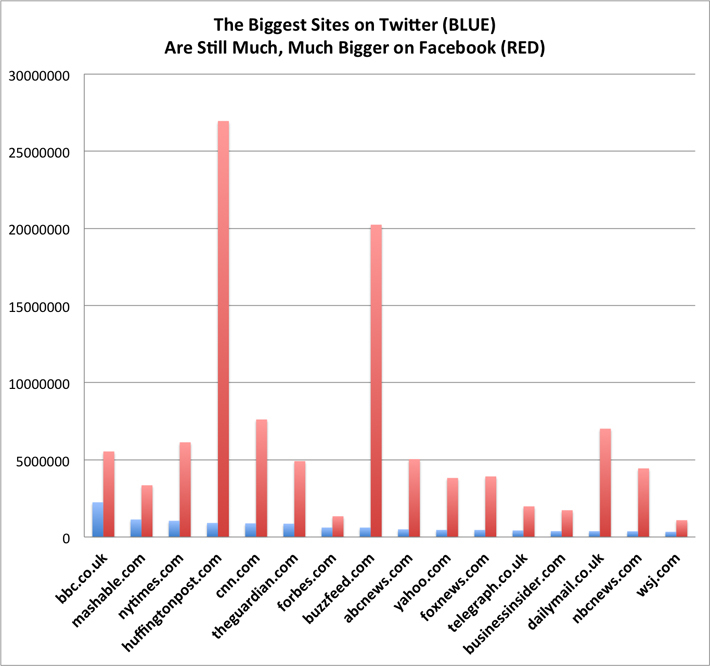 The difference in followers between FB and Twitter is very surprising and means more focus on FB. The info on the headlines is also extremely helpful. Thanks, and I’ll be sharing this. Thanks Amiti. It’s really good to see you again. Glad you liked this article. It’s true as per the Spike data shows Facebook is much bigger than Twitter but one shouldn’t neglect other social media platforms too until unless they try and test it out. Yes, Facebook is much more popular than Twitter. Only business person and creative person can use twitter effectively but Facebook is much common than Twitter in now a days. That why we need to focus on this social media. Hey Cheenu, surely Facebook has got much more users than Twitter but it’s not a good decision to rule out other social networks. As the recent data shows Instagram tops everyone in active usage. But ultimately what matters is to go where your target audience is already hanging out.